*Prices inside ( ) are group rates for groups of at least 20 persons. Admission is free of charge for holders of a physical disability certificate (rehabilitation certificate) or mental disability certificate, and their helpers will be admitted at half-price. Members of the Paper Museum Associates can enter the Museum free of charge upon showing their membership certificate. A common ticket for tours of “3 Museums in Asukayama” (Paper Museum, Kita city Asukayama Museum and Shibusawa Memorial Museum) is available for purchase (adults 720 yen, children (ages 6-18) 240 yen) (valid for 3 months). We participate in the “Grutto Pass”. The Paper Museum is located within Asukayama Park in Kita-ku, Tokyo. 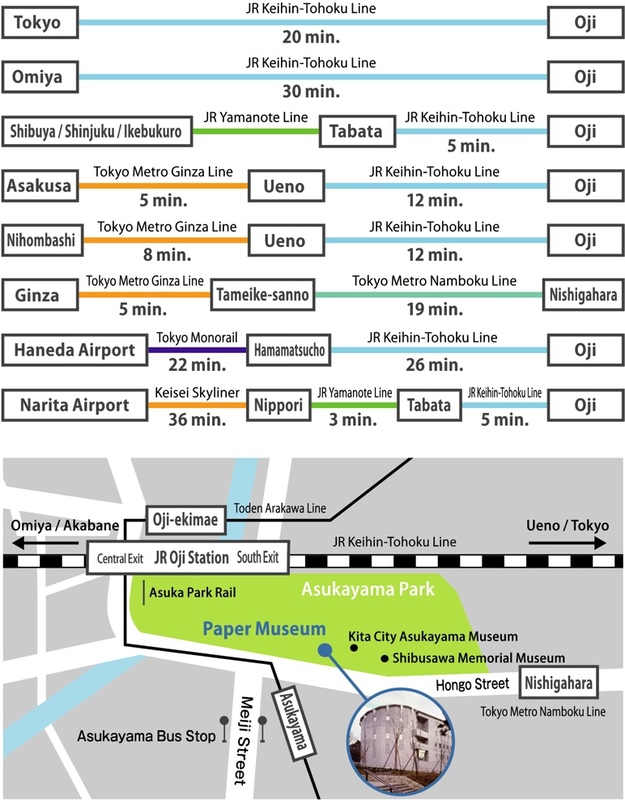 The nearby JR Oji Station is about 20 minutes away from Tokyo Station on the JR Keihin-Tohoku Line. This location is easily accessible from Ueno, Asakusa and Ikebukuro. *No exclusive parking available. Please use the Asukayama Park parking lot (charges applied). Email　→Please use Contact form. Please cooperate with the following points in order to protect the items on display and ensure that many people can enjoy viewing the works. Eating and drinking (including bottled water, candy and gum, etc.) is not allowed inside the Museum. Please set your cell phone to silent mode, and refrain from talking on the phone while inside the Museum. Please do not touch the displayed items and display cases. When talking, please be considerate so as not to bother other visitors. Please make sure that you follow instructions from the Museum staff in the Museum. Closed : Mondays(except national holiday), Weekday immediately following a national holiday , New Year's holiday , period Special closure .